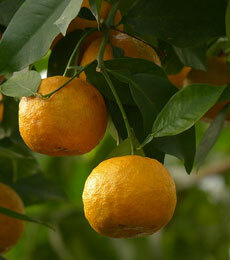 Petitgrain essential oil is steam distilled from the leaves and twigs of the Citrus aurantium, the bitter orange tree. This same tree produces Bitter Orange essential oil from the fruit and Neroli essential oil from the blossoms. This oil is a pale yellow-brown colour and has a floral, citrus scent with woody undertones. Has anti-septic, deodorizing, sedative and anti-depressant properties. Said to be beneficial for acne, anxiety, depression, perspiration, insomnia, oily hair and oily skin. Often used as a fragrance component in soaps. Non-toxic but may cause some irritation in some individuals. Blends nicely with citrus oils, floral oils, cedarwood, marjoram, clove, eucalyptus, benzoin, juniper, oakmoss, palmarosa, patchouli, clary sage, frankincense, rosemary, and sandalwood..